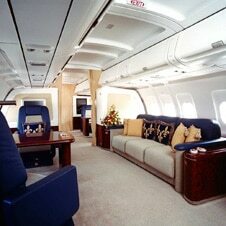 The Airbus ACJ319 Elite is amongst the largest VIP aircraft available for charter. They are very well suited for groups of up to 44 passengers on long haul travel. In addition to a cabin comprising entirely of First Class seats, a stateroom can sometimes be offered. Dependent upon the individual aircraft, up to 100 suitcases can be accommodated. VIP catering is served by highly experienced cabin crew. The range of this aircraft varies between 8 – 9 hrs.